Government plans to develop, in partnership with the private sector, the Pace Grasso football ground area into a complex that would include residential units, besides sports facilities. Parliamentary Secretary in the Ministry of Education Jesmond Mugliett has been given the green light by the Cabinet to proceed with the project. The government will now be submitting an outline application to the Malta Environment and Planning Authority and the call for tenders is expected to be made in January. The project will incorporate a home for the elderly, assisted-living apartments for the elderly, offices, a commercial area, parking bays and lock-up garages. Mr Mugliett said: "The government intends to pass the land, valued at Lm2.5 million, to the developer. Construction work is estimated at Lm5 million and the value of the various completed parts of the project would amount to more than Lm12 million." He said the consortium undertaking the project would be expected to pass back to the government certain facilities to compensate for the site. These would have to include a football pitch, other sports facilities, a number of beds in the old people's home and a number of parking spaces. The other facilities will be retained by the developer to generate revenue from rent and sales. Mr Mugliett said the size and location of the Pace Grasso ground offered good opportunities for development. The whole facility sits on 16,000 square metres of land which is bounded by three streets and is strategically located between Paola and Fgura. The football ground as built at present was occupying twice the land needed. Other factors that made the place suitable for development were its close proximity to open areas and schools, and its location within a dense urban area. 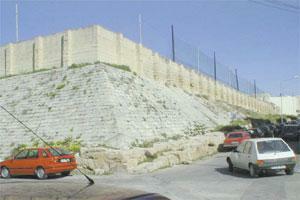 He said preliminary proposals had already been discussed with the MEPA. "The authority has recognised that the site is ripe for development and internal discussions on the project are underway, keeping in mind the south local plan currently being formulated." The Pace Grasso football ground was built in 1946 on land made available by the government.